Looking to save on your office running costs? Come and see our modern offices at Mirren Business Centres. 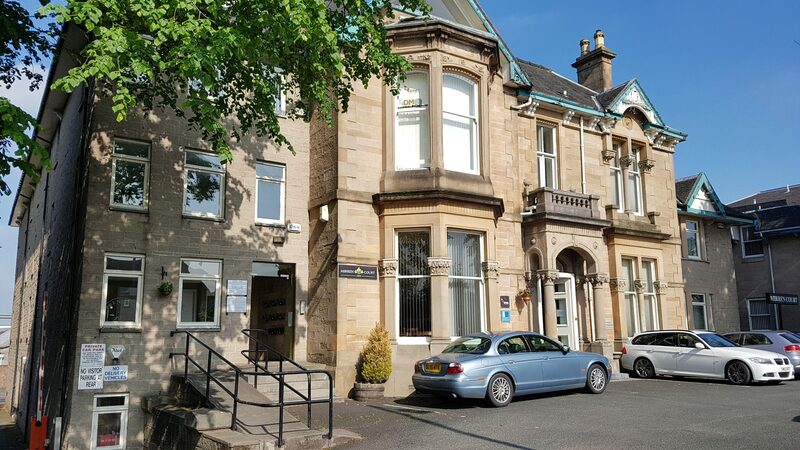 We have just started refurbishment works at Mirren Court, Renfrew Road, Paisley to create five new small offices from 150 sqft with all-inclusive rents from £ 185 pcm + VAT, to meet the needs of our prospective tenants. LAST TWO OFFICES LEFT – Join our beauty team and take advantage of our lovely space in Mirren Business Centres in Paisley! The new offices with common tea prep and break out area will be re-carpeted and freshly decorated and ready for occupation at the end of February / beginning of March 2018. The offices are ideally located near M8 Jct and Glasgow International Airport and benefits from lots of nearby facilities such as: visitor parking, meeting room facility, on-site Management, excellent access to public transport, lots of amenities nearby (PureGym, Frankie & Benny, KFC & McDonalds, Braehead Shopping Centre, Junction Retail Park and much more). We would be delighted to show you around and if you would like to come and see it just let us know. Call on 0141 843 4211 or visit our website to find out more about our offices to let.